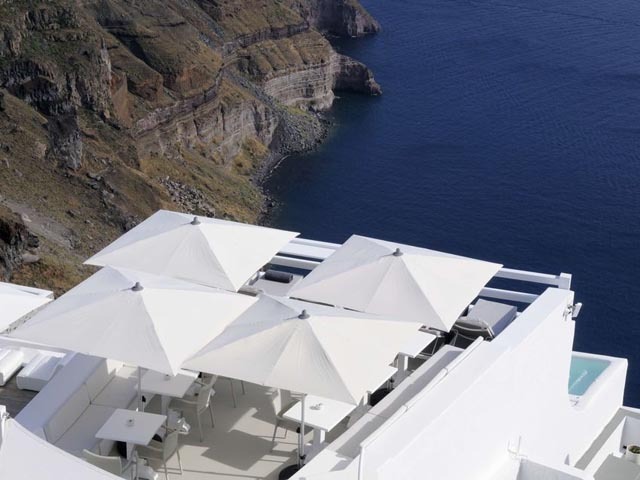 Built amphitheatrically on a hillside at the Caldera, in a complex of 5 white-luxury suites. 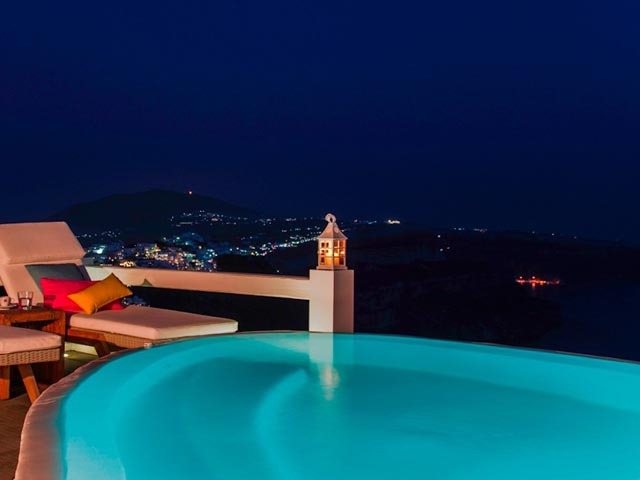 It offers superb panoramic sea view of the entire bay of Santorini and the volcano and is ideal for couples and honeymooners.Aqua Luxury Suites is operating, as from this year, under new management. An extensive renovation plan has been just completed; all hotel suites are totally refurbished and freshened-up. 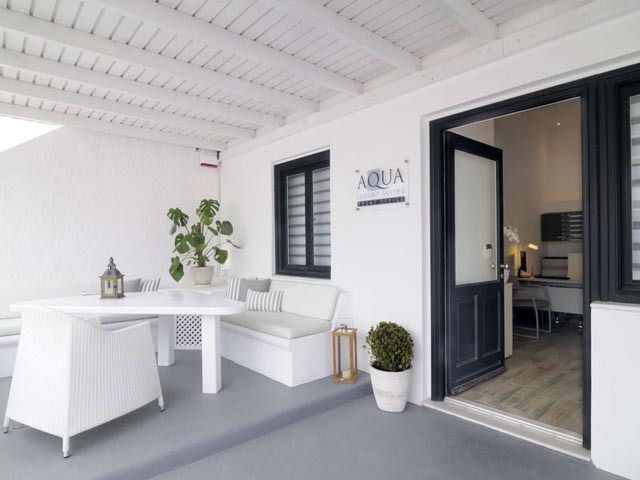 Aqua Luxury Suites allows for a restful holiday escape, in a relaxed and cozy environment, at a place of exceptional beauty, perfectly combining high quality services and great value for money that will exceed your expectations. Ideal for couples and honeymooners, in Aqua Luxury Suites you will enjoy unique memorable sunsets. Aqua Luxury Suites offers full breakfast served every morning in your suite.Light snacks and drinks can be ordered 24h. Our Superior Suite offers a spacious place for tranquility and invigoration, with breathtaking caldera and volcano views, overlooking the blue waters and the magnificent horizon. With a king size bed and all the conveniences you could have asked for, this suite can accommodate up to 3 persons and is perfect for couples. The private hot tub outdoors is certainly a highlight in your stay at Aqua Luxury Suites, providing the absolute way to unwind and get filled with energy in such an inspiring setting. Our Superior Sunset Suite is a unique place for tranquillity and recreation, with breathtaking caldera and volcano views, overlooking the blue waters and the magnificent horizon it provides majestic panoramic Sunset views. With a king size bed and all the conveniences you could have asked for, this suite can accommodate up to 2 guests and is perfect for couples. The private use hot tub outdoors is certainly a highlight in your stay at Aqua Luxury Suites, providing the absolute way to unwind and get filled with energy in such an enchanting setting. Welcome to our apartment, which can host up to 4 persons and provide the perfect solution for families and parties of friends. There are two bedrooms with comfy furniture indoors, while outside you may enjoy the ample private terrace with magical views to the caldera and volcano, as well as the abundant sunlight. A boat staircase connects the two floors of the apartment and takes you to the cozy loft bedroom upstairs, while the terrace is fully equipped with a dining area. Introducing you to our Mare Grand Suite, an oasis of tranquility and superb vistas to the Aegean, the volcano and the breathtaking caldera! This suite has been especially designed with focus on the beauty of the natural surroundings, filled with sunlight and decorated elegantly. Outdoors, there is a heavenly private use heated plunge pool that allows you to dive in crystalline waters and gaze at the mesmerizing caldera. Inside, the suite is fully furnished and includes all the conveniences desired. With two bedrooms, the suite can accommodate up to 4 persons. Our Junior Suites are spacious and can host your dreams throughout your stay at Aqua Luxury Suites. With awesome views to the volcano and the caldera, these suites are comfortable and modern, filled with natural sunlight and great facilities. You may enjoy the outdoor private balcony for an experience you will cherish forever, especially at sunset hour. There is a king size bed and the suites are perfectly equipped with all the details that will transform your stay into a magical one! They can accommodate up to 2 persons. This is the ideal Suite for couples, for people who enjoy large spaces outdoors with unforgettable volcano and caldera views. If you wish to relax and soak under the sun or chill out in the evening in a magnificent environment, the Executive Suite will amaze you. It comes with an outdoor heated plunge pool and modern furniture both indoors and outdoors, accommodating up to 2 persons in its elegant spaces. Experience the true way of life for the locals in Santorini, staying at our Honeymoon Cave Suite. This is an inspired place for couples in love, where tradition meets modernity and where the all-white décor fills the space with light. Modern furnishing and a comfortable king size bed make your stay here magical, while there is also a heated Jacuzzi indoors for endless romance and a small yard with dining equipment. Feel what it’s like to be a Theran in your honeymoon and travel through time, in this lovely suite that accommodate up to 3 persons. 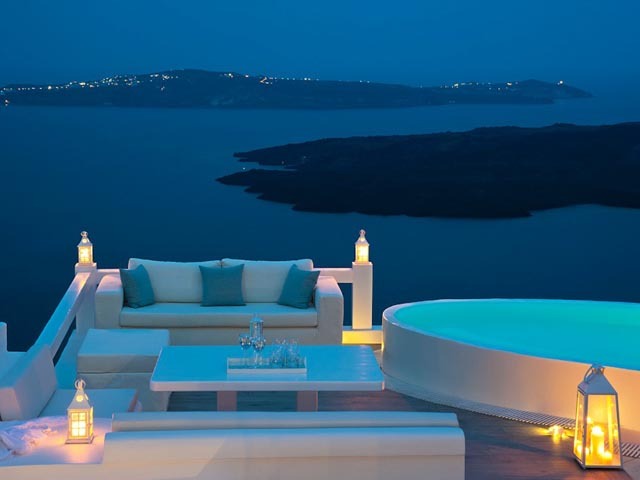 This is the suite for honeymooners and couples that seek the absolute holiday experience in Santorini. It stands tall above all the other suite levels, providing exceptional privacy and amazing panoramic sea view to the caldera & the volcano. A fully furnished secluded terrace and outdoor hot tub will allow you to enjoy the natural wonders of Santorini to the fullest. Inside, a king size bed and modern furnishing add to the comfort of the suite. Since this is a honeymoon suite, it can accommodate up to 2 persons. Celebrate love in a magnificent setting! The idyllic suite for honeymooners and couples in love, accommodating 2 persons! Honeymoon Suite is comfortable and elegant, providing the perfect sanctuary of love and passion. Enjoy the panoramic views to the caldera, the volcano and the breathtaking sunset, watch the sun going down to sleep and diving in the crystal clear waters of the Aegean, as you soak in the private outdoor heated tub or sit back in your private balcony. Inside, a king size bed and modern furniture indoors and outdoors, lavish bathroom amenities and all the other conveniences add to the most romantic getaway in Santorini. Our Aquarella Suite provides superb privacy and incomparable views to the Aegean, the volcano, the imposing caldera and the blue horizon. In a large fully furnished terrace, there is a private heated plunge pool and from there you get great views to the caldera and the gulf of the island. Luxury décor and design in line with the natural surroundings, modernity and extravaganza all define Aquarella Suite. Relax in the king size bed and lay back at the sun loungers, breathing in the fresh air and overlooking Santorini’s marvels! Welcome to our Senior Suite, a place where style and elegance meet comfort and tradition, where you may relax and enjoy the wonderful caldera and volcano views. The minimal décor and the white color that prevails indoors offer supreme accommodation, in a warm and friendly suite. The furniture is comfortable and modern, guaranteeing the ultimate relaxation. The suite comes with a private hot tub outdoors and full sunset sea view, accommodating up to 2 persons. This is the place where love birds find their nest in Santorini and this is the ultimate sanctuary of passion for our precious guests. 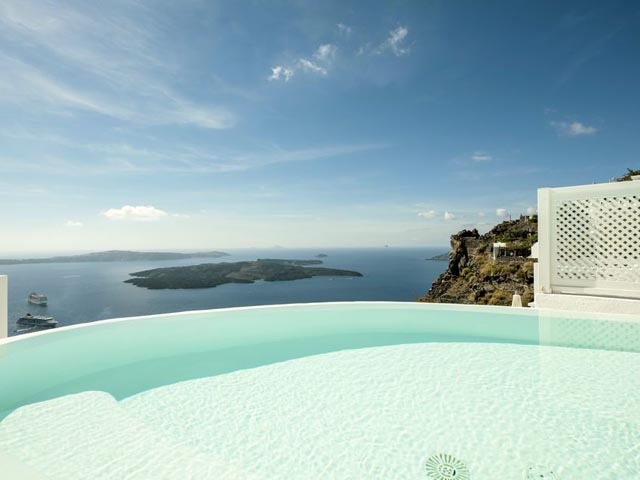 The two private balconies overlook the famous Skaros Rock, the romantic sunset, the caldera and volcano, completing the timeless scenery. Bright colors and distinctive traditional architecture, lavish amenities and comfy furniture will provide the most wonderful stay in Santorini for you. This room can host up to 2 persons. Enjoy the sunset from the most prestigious place of Aqua Luxury Suites, with spectacular views to the Aegean Sea, the caldera and the volcano, with the absolutely fabulous sunset. From the private outdoor heated tub, watch the sun dipping into the deep blue waters and spreading its warm colors all around, offering the absolute spectacle. Cycladic architecture is blended with stylish decorative details and the outcome is purely amazing. Indulge in our Sunset Suite, which can accommodate up to 2 persons and is ideal for couples who wish to get awesome views and genuine privacy. 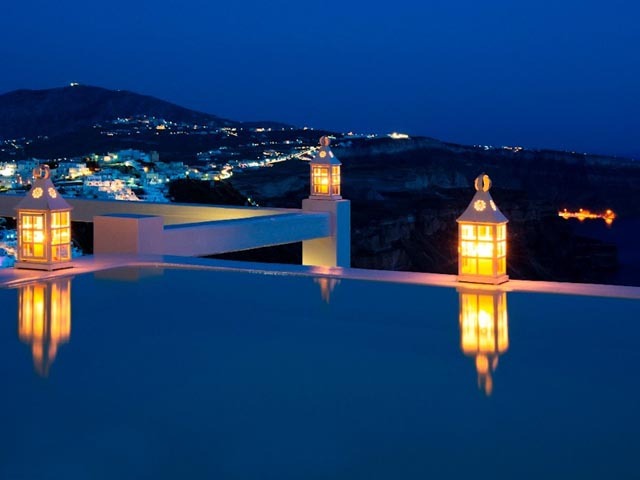 Stay in an authentic Santorinian Suite with panoramic caldera & volcano sea view. Accommodating up to 3 persons, this suite includes a king size bed, sitting area & a separate bedroom with a sofa bed. A private balcony is fully furnished with a dining area, as the most enchanting spot to enjoy amazing sea views. The outdoor heated tub allows you to surrender to a journey of the senses, as you gaze at the magnificent horizon. A suite highlighting the natural beauty and uniqueness of Santorini! Our Double Room provides a cozy accommodation type for couples, with a panoramic caldera and volcano view and exquisite natural sunlight. A king size bed and a sitting area will make the most out of your feeling of serenity and comfort. The modern furniture and the all-white decoration, the lavish bathroom and the audiovisual equipment all add to your comfortable stay. Our Double Room can host up to 2 persons. 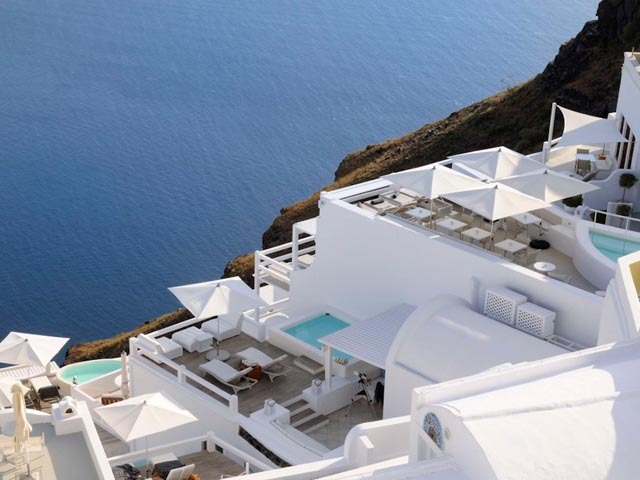 Enjoy Santorini in the most prestigious spot in Imerovigli, at Aqua Luxury Suites. Enjoy grand living in our Grand Suite, in an elegant environment of Cycladic architecture and modern furnishing, both indoors and outdoors. This suite includes 2 bedrooms and can accommodate up to 4 persons and is ideal for couples in love, families and friends. 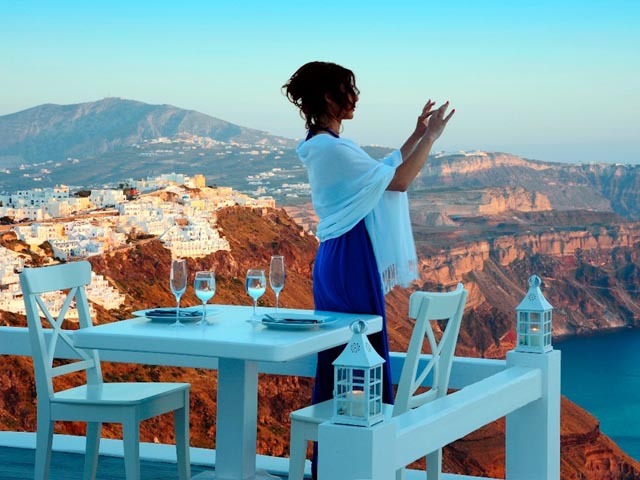 Panoramic views to the Aegean, the caldera and the volcano provide the ultimate inspiration, for guests who seek to admire the unparalleled natural beauty of Santorini. An outdoor heated plunge pool will allow you to relax, sipping on an iced cold beverage and overlooking the horizon. Our Jerry Junior Suite with outdoor plunge pool can host your for a remarkable stay at Aqua Luxury Suites. Comfortable and modern it is filled with natural sunlight and great facilities. You may enjoy the outdoor heated plunge pool with sea views for an unforgettable experience that you will cherish forever. There is a king size bed and all of our suites are perfectly equipped with all the details that will transform your stay into a magical one! Jerry Suite can accommodate up to 3 guests. Welcome to our Ellen Junior Suite, where elegance meets comfort and where you may relax and enjoy the majestic aura of the island. The minimal décor and the soft colour tones offer supreme accommodation, in a warm and friendly suite. The furniture is comfortable and modern, guaranteeing ultimate relaxation. The suite features an outdoor sitting and lounging area and can accommodate up to 3 guests. 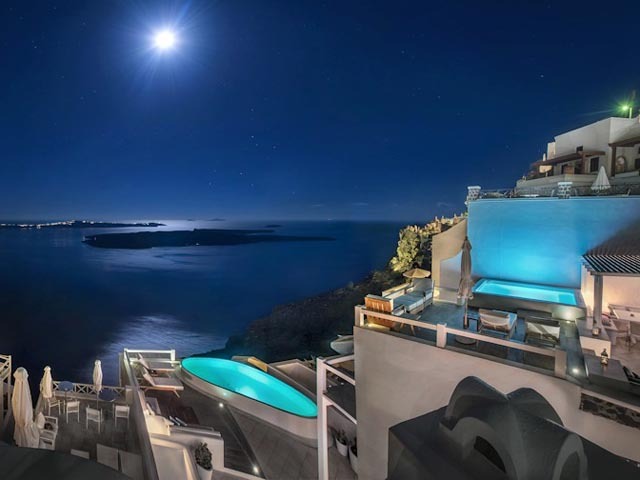 Aqua Suites at Imerovigli village - the most prestigious location on Santorini - offers exclusive accommodation in just 5 units coupled with attentive staff. Located at the highest point of the island, 300 meters above sea level at the historical rim of Caldera, the views from Aqua Suites to the volcano accompanied by romantic sunsets where the sun dips into the Aegean Sea, Imerovigli village is home to Aqua Suites. they double booked for the first night. that was not the problem, it can happened to everybody. they offered us a room to the hotel next to them better than the one we reserve in Aqua Suites but the let us in 2 hours after the informed me about the doublebooking. They never informed me that 12 oclock i must check out of the room so they took our bags and personal belongings like we were refugees and put them in the reception, without letting us know. They did had my mobile number and my email and the y didnt use it to let me know. the lady in the reception of the Aqua Suites offered me a complimentary massage .FOr me was not such a good way to apologise for the mistake. We traveled 7 hours to go to Santorini and we were expecting to have our room as a booked it through the internet 20 days before our arriving. I also contact with the travel advisor of the office 2 times but they never let me know that we will have this problem. 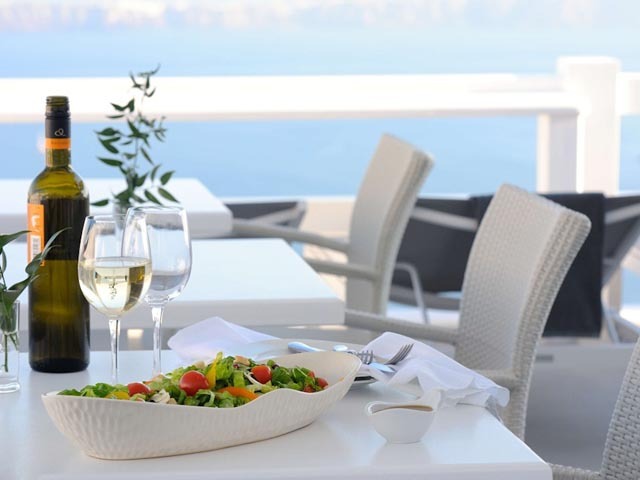 Open from April to November... Aqua Luxury Suites is a small boutique 5* sea view hotel, facing the caldera and the volcano, in Imerovigli, Santorini, one of the top destinations in the Mediterranean.